(Mar 23, 2012) Anonymous said:Terrible shop, mainly golden oldies but I did buy some gems there. (April 2, 2015) This sold cards as well but the right hand side as you went in was always worth a look through the racks (as any record shop was back then) I do recall buying my first new Tamla Motown 45 there (Jimmy Mack) in the summer of 1981 and my Jam Beat Surrender double pack came from there too. They had a second branch in Kinson (which can be added to this database) at 1436 Wimborne Road. 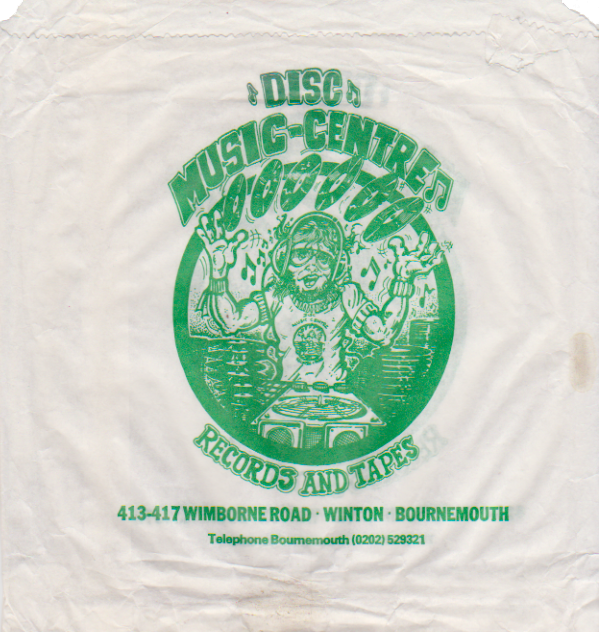 I shopped here first (late 70s) as it was my local.This changed hands becoming Discs & Cards and then Kinson Record Centre. Where was my head at,the record counter was on the left as you went in! To be fair I was thinking back to actually being in the shop(like you do) and typed as I was (in my head) looking towards the front door. Putting yourself back in these shops and remembering what you were buying back then is what this is all about,isn't it? Comment: Glenn Johnson.